It is important for the University of Idaho to offer students meaningful, inclusive, and accessible learning opportunities. We are excited to announce that in Fall 2018, a limited number of BbLearn courses are trying out a new product called Ally. Ally provides students with alternative formats for files distributed via BbLearn. For Word documents, PowerPoint documents, and PDF's, you can download alternative formats of the content (e.g. Audio mp3 files for learning on the go). Watch the 48 sec video below to learn more. Note: You may access Ally's Alternative Formats from your phone via a Web browser, but not through the BbLearn Student app. However, Alternative Format access is coming to the Bb Student app in a future release. Select the grey option icon next to a content item or attached file. Select the Alternative formats option from the dropdown menu. Select one of the available formats. Note: Ally automatically creates alternative formats for most course documents, but will not be able to accurately convert documents that contain handwritten or poorly scanned information. The file may take a few minutes to generate and download. Note: Ally is available in a limited number of courses at this time. 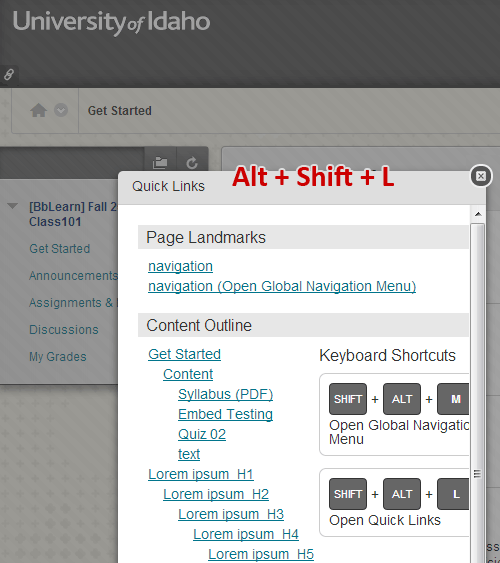 Press Alt + Shift + L on your keyboard to access the Quick Links navigation in BbLearn. Yon may press Tab (down) or Shift + Tab (up) to navigate to your course content.